Investors weren't too thrilled by what they heard from Janet Yellen during her first meeting in charge of the Fed. 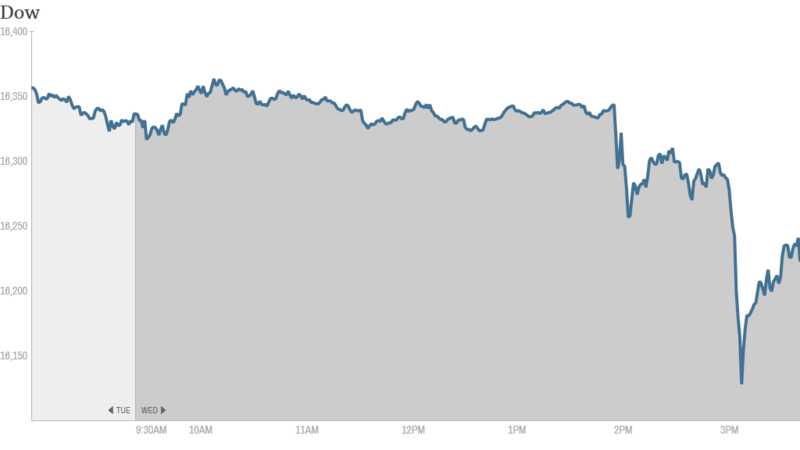 The Dow fell more than 100 points, while the S&P 500 and Nasdaq also finished lower. Stocks were relatively stable as Yellen started her press conference. But the Dow fell as many as 180 points before recovering after she said the Fed's stimulus program would most likely be finished by the fall and that a rate hike could come as soon as early 2015. Prior to the press conference, the Fed said it will continue trimming, or tapering, its monthly bond buying program by another $10 billion, to $55 billion a month. Those asset purchases, a policy known as quantitative easing, started at the height of the 2008 financial crisis to support the U.S. economy. Many experts say it also has been a key driver behind the bull market in stocks for the past five years. The Fed also said in its statement that was dropping its 6.5% unemployment threshold for hiking interest rates, instead saying that it will strive for maximum employment and 2% inflation before any rate change. The central bank added that it would keep interest rates near zero for a "considerable time" after its bond purchases end. But in response to a question at the press conference, Yellen said that a "considerable time" could be as short as six months. Additionally, the Fed said the cold weather slowed economic growth in recent months. Bond yields spiked on the Fed news as well. The rate on the 10-year Treasury note rose to 2.77% Wednesday from 2.68% a day earlier. Bond yields rise when prices fall and investors often sell bonds at times when economic data is improving. In corporate news, home builders were among the biggest gainers. KB Home (KBH) shares jumped after the company reported earnings that beat analysts' expectations. Rivals Lennar Corporation (LEN), D.R. Horton (DHI), and PulteGroup (PHM) also rallied. On Tuesday, the government reported that building permits, a sign of future construction, rose by 7.7% in February. 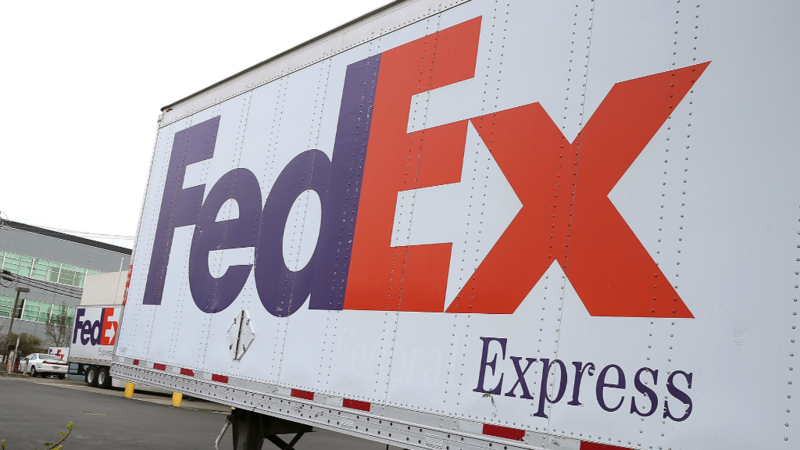 FedEx (FDX) blamed "unusually severe winter storms" for quarterly earnings that came in below estimates. But the fact that snow would impact FedEx wasn't that big of a surprise, and shares of the shipping company fell only slightly Wednesday. UPS (UPS) reported a similarly poor profit last quarter due to the weather. Both stocks are in negative territory for the year. But one trader on StockTwits thinks investors are no longer that concerned about companies blaming the weather. "$FDX Let's see if giddy mkts forgive FDX earnings miss "weather ate my profits" and they rally it could be a common theme this quarter?," said WiseOwlTrader. But FedEx is often viewed as a bellwether for the economy, and LDrogen thought its earnings could affect other companies. "Ouch, expect a lot of lowered estimates off of the bad $FDX numbers today," he said. Shares of Orbitz (OWW) tumbled 9% after the travel site operator was downgraded to a "sell" rating by analysts at Goldman Sachs. First Solar (FSLR) shares soared 21% after the company said it plans to develop a solar power plant with General Electric (GE) as part of the two companies' partnership that was announced last year. The stock has soared 135% in the past twelve months. That had one trader wondering if it's time to sell. "$FSLR good day to take profit." said truongjh. Horizon Pharma (HZNP)surged after the biotech company said it was buying Dublin-based Vidara Therapeutics International for $660 million. Biotechnology stocks have been on a tear this year, although some of the leading stocks have pulled back lately on concerns about valuations. "Biotech Lottery is back! Today's early winner---> $HZNP," said chicagosean. European markets and Asian markets both ended with mixed results Wednesday as traders around the world were all waiting for the Fed.